In the interest of following through with what most Extension folks recommend, I'm finally getting my soil tested. Here is what the sample looked like before I bagged it up and dropped it off at the soils lab. The idea is that you take several samples from around the yard, mix them up in a bucket, and then spread out a few cups worth on newspaper or a brown shopping bag to dry. Then you package the soil and drop it off at the soil lab. You can either select to learn the pH and lime requirement, or you can go whole-hog and get the soil fertility tested. The latter test provides pH and lime requirements and also reveals the presence or absence of other nutrients--phosphorous, potassium, calcium, and magnesium. I should get my results back within two weeks. 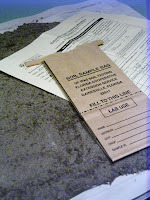 For more information about soil testing in Florida, visit the Soils Lab Web site or contact your county Extension office. Sorry about the funny color in the photo. My personal camera has been acting up recently. As part of my Master Gardener training, our class visited Marjorie Kinnan Rawlings' home at Cross Creek. The first picture shows the group standing in the vegetable garden, which is located pretty close to the house. Jacque, an Alachua county Master Gardener, volunteers her time to maintain the garden. When we visited, the garden was planted with cool-season crops like turnips, collards, carrots, mustard, lettuce and kale. We also wandered the grounds and looked at the many citrus trees on the property. This image shows freeze damage. Wendy Wilber, Extension agent for Alachua County, explained that the sap in the tree stops flowing when temperature drop to freezing on cold nights. In the morning, the sun will begin to heat up one side of the branch and thus thaw the sap. The back side of the branch remains frozen, and the resulting pressure causes the bark to split open on the shady side of the branch. We also saw citrus rust mites on many of the oranges. Wendy said these only cause cosmetic problems and don't affect the flavor of the fruit, so it's usually not necessary for homeowners to treat the problem. For more photos from the Cross Creek trip, visit the Gardening in a Minute Flickr site. I figured that before I install the new plants, I should probably prepare the bed properly. I didn't want to spend a lot of time making the bed pretty, only to be plagued by recurring weeds down the road. I opted for a general application of Round-Up to get rid of the stuff already growing in the bed. I discovered this great contraption at the store--you pour the concentrate into the sprayer, attach it to the garden hose, set the dial appropriately, and away you go. No measuring, no fuss. Wouldn't you know it--thirty minutes after I sprayed, the heavens opened up and rained on my efforts. I think the Round-Up had time to dry before it rained, so I'm hoping that it's effectiveness won't be compromised. I'm not sure that it will sufficiently kill all of the invasive elephant ears since they also have underground tubers or the woody, viney weed that's in most of my beds. The good thing about the rain is that it drove away the mosquitoes and I was able to install the edging with a minimum donation of blood. Once the Round-Up has settled in, I'll mix in some Black Cow with the existing sand, er, soil. Then I'll remove my plants from their waiting zone and install them in the bed. So here's the bed I'm going to re-do. You can see my tentative bedline marked out in orange spray paint. The bed used to consist solely of a row of ligustrums that did nothing but grow like crazy and obscure the windows. Also, the crape myrtle always seemed stranded out in front of the shrubs. I finally got tired of pruning the ligustrums and ripped them out. I passed them along to a friend who lives out in the country and was looking for some larger shrubs that could act as screens. So far, they seem to be settling in nicely at his house, despite the fact that I didn't do any preliminary root pruning before digging up the shrubs. I'm planning to add new plants that will give a range of texture and color. I'm going to put shorter plants in front of the windows so that I'm not constantly pruning, and then add a few taller plants for height between the window areas. I can hardly wait to see how it all turns out! The environmental horticulture student club is selling bat plants as a Halloween fundraiser. How could I resist this crazy looking plant? For one, it has the oddball look that I love. And two, it has one of favorite color combos--purple and green. The club advisor says they'll work well as a house plant. I'm hoping to plant mine outside in a new bed I'm laying out. I figure if I baby it then maybe it will make it through the North Florida winters. I'll be sure to take post pictures once my own bat plant arrives. I'm also in love with this pineapple lily (Eucomis comosa 'Oakhurst') that was featured in the National Gardening Association's regional gardening news email update. For more information, visit the Terra Nova Nurseries site. So what triggered me to start a gardening blog? I have long been fascinated with lush, tropical gardens and the layers upon layers of bold texture, color, and foliage you find within them. Chalk it up to a childhood in Florida. When I became a homeowner 10 years ago, I had dreams of converting my backyard into such an oasis. Then reality set in. I was just one person. How could I single-handedly transform my standard suburban yard into such a paradise? 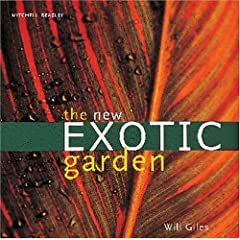 I just finished reading an advance copy of "Exotic Planting for Adventurous Gardeners" by the late Christopher Lloyd and friends. The book will be released in December 2007 by Timber Press. Lloyd is well known in the gardening world for ripping out the roses at his mother's English country estate and installing in their place what has come to be known as the exotic garden. This same look is what I crave in my own yard, and I'm finally feeling the bug to take a whack at it again. So, I figured why not document my own yard's transition from blah to bold using the medium that's known for pushing the limits--the Internet. Who knows--maybe there are others of you out there who are attempting the same! "When Christo sacked his mother's roses years ago and replaced them with bananas and other weird and un-English plants, I loved it. It made me laugh out loud to see the dahlias bouncing about with the cannas and bananas."